Johnny’s Auto Service offers Car Maintenance in Azusa and the surrounding area. We’re located in convenient Covina, our shop goes a step beyond most dealerships and auto-mechanics. When you search for “car maintenance near me” you deserve a shop you can trust with your vehicle. We offer affordable prices, friendly technicians, and the automotive know-how to service any make or model of vehicle, whether you drive a hybrid, a state-of-the-art foreign car, or a classic domestic vehicle. Your car is more than just a way to get around. It can be your second home–your baby. It’s so important to treat it right, whether you need simple scheduled maintenance or have a larger problem that needs to be addressed. All of our technicians are ASE-certified. In fact, our shop carries the ASE Blue Seal of Excellence and we have ASE Master Technicians working on-site. We have the know-how to tackle any issue, from an oil change to a major engine repair. Plus, we’re up-to-date on all the latest technologies. Modern cars require more than just mechanical knowledge, but computer and electrical expertise as well. Our mechanics can perform diagnostic tests to get to the bottom of any issue. 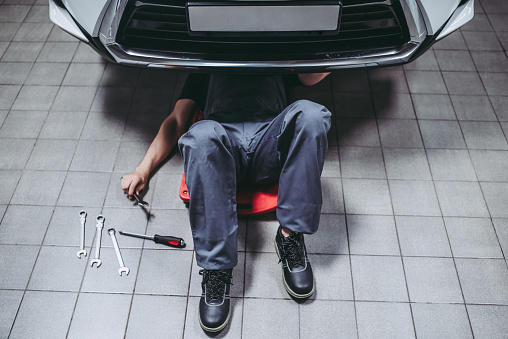 If you’ve been googling “car maintenance near me” it may mean that you’re in the market for a new home for your vehicle’s scheduled repairs. Why not come to a clean, professional shop with a friendly staff? Our shop is spotless, and our mechanics know how to speak the terms that you can understand. They’ll lay out exactly the necessary car maintenance in Azusa for your particular vehicle and get you back on the road in no time. Because a well-maintained car is key to a life that runs smoothly. Visit us online today at www.johnnysautoservice.com to fill out our repair request form, or call us at (626) 966-5212. We can’t wait to hear from you.